Acer’s Next@Acer press conference in New York featured a whirlwind of announcements: new Chromebooks, notebooks, gaming laptops and more. Amidst the onslaught of new and refreshed computers, Acer paused to talk about something genuinely new — ConceptD. Usually, I’d yawn at an announcement about professional grade PCs and dive right into the gaming stuff with glee. But ConceptD intrigued me. Maybe I’m getting old, or maybe my time at MobileSyrup has changed my perspective on computers, but ConceptD was really exciting. I’ve always had a preference for Windows laptops, and Windows 10 is, in my opinion, really, really good. Apple’s macOS offers beautifully designed software and hardware, but I don’t think it’s enough to make me switch. I will say, however, that Windows PCs have lacked a real MacBook competitor outside of Microsoft’s own Surface Laptop and Surface Book options. I’d argue that the primary problem with both Microsoft’s and Apple’s offerings is the price. They’re great products, but they’re costly, especially in Canada. 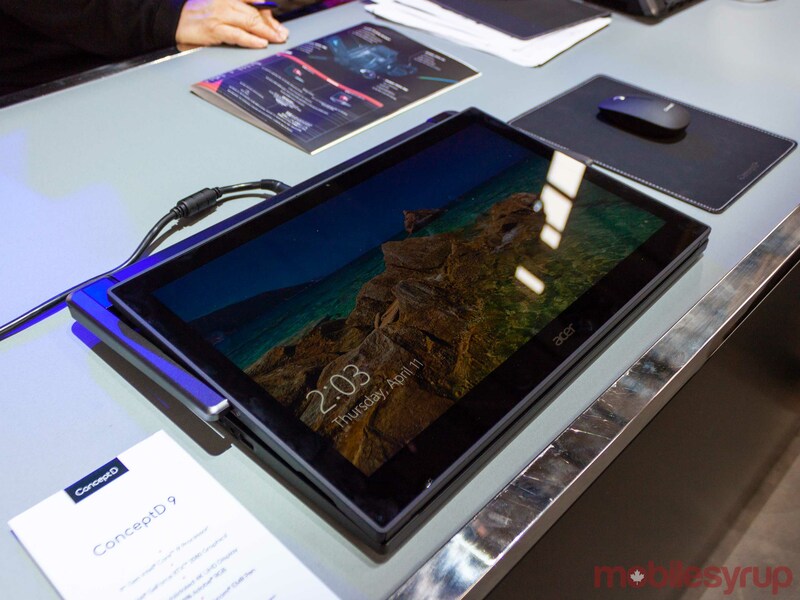 However, Acer’s ConceptD notebooks should be slightly more affordable while also offering more power for users, all in packages that are wonderfully thin or unlike anything you could imagine. The ConceptD 5 is probably the most reasonable of the new laptops, and the one you’re probably going to buy. It’s a traditional clamshell laptop, and it’s remarkably thin and light for all the power packed into it, measuring in at 360mm wide x 242mm deep x 16.9mm high and weighing 1.5kg (3.03 pounds). Packing into that small chassis is either an 8th Gen Intel Core i7-8705G or i5-8305G processor, 16GB or 8GB DDR4 RAM and AMD Radeon RX Vega M GL graphics. It’s also got either 512GB or 1TB SSD storage. But more impressive than the specs was the ConceptD 5’s display. Acer made a big deal about it during the keynote, and it looks absolutely stunning. I’ll still need to get it next to a MacBook’s Retina display to really compare, but it blew me away when I saw it on the showroom floor. 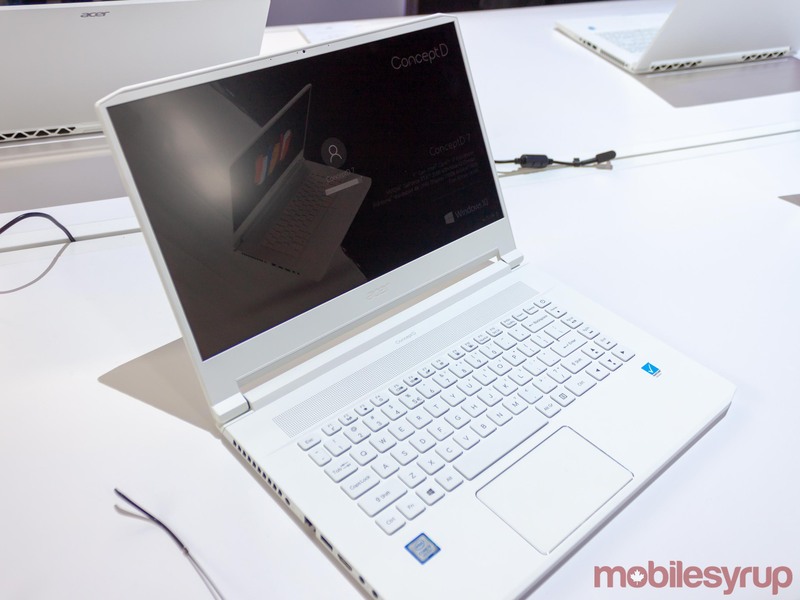 The ConceptD 5 sports a 15.6-inch Ultra HD 3840 x 2160 pixel IPS display. It boasts 400nits of brightness and displays 100 percent of the Adobe RGB colour gamut. It’s also incredibly accurate as well. Acer says the display has a DeltaE measure of 1.2, and it’s validated by Pantone, a U.S. company known for its proprietary colour space matching system. For the unfamiliar, DeltaE is a way to measure how humans perceive differences in colour. The lower a DeltaE measurement, the closer the display reproduces a colour to the input colour. A DeltaE of less than one between two colours that aren’t touching is barely perceivable to the average human. The ConceptD 5’s measure of 1.2 matches that of the 2018 15-inch MacBook Pro, according to Acer. Acer also made a big deal of how quiet its ConceptD computers are, noting that they’re all under 40 a-weighted decibels (dBa) — a measure of the loudness of sound in air as heard by the human ear — when under load. The ConceptD 5 is the quietest of the three new laptops, coming in at 31dba — a whopping 15.8dba quieter than the 15-inch MacBook Pro under load. Acer’s ConceptD 7 laptop is a step above the D 5, sporting a near-identical 15.6-inch UHD display, that’s slightly more colour accurate with a DeltaE of 1.1, all in a slightly bigger, beefier chassis. The D 7 measures in at 358.5mm wide x 255mm deep x 17.9mm high and weighs 2.1kg (4.6 pounds), making it a fair bit heavier. However, with that extra beef comes some significant power. Acer stuffed a 9th Gen Intel Core i7 processor, along with 16GB of RAM (upgradeable to 32GB) and an Nvidia GeForce RTX 2080 Max-Q GPU. Users can also get the regular RTX 2060 if they prefer. Beyond that, the D 7 doesn’t do much to differentiate itself from the D 5, other slightly beefier speakers. It is, however, much more expensive (more on this later). In my mind, one of the staple features of a laptop is portability. While you can undoubtedly get powerful thin and lights, there’s a point where you just can’t fit power into a small body. 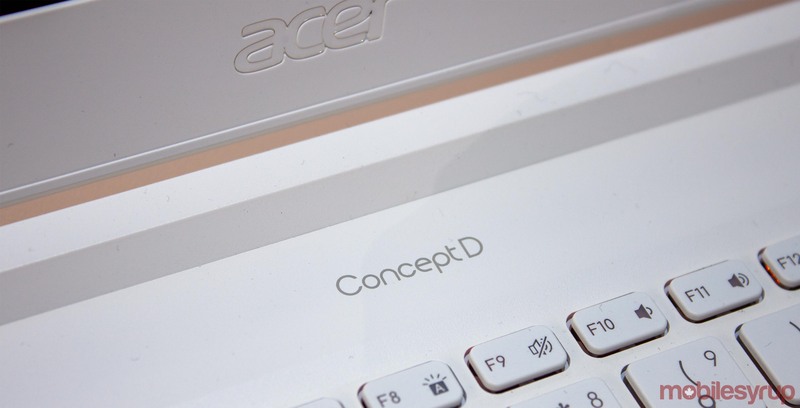 Acer did a create job making the D 5 and D 7 compact. With the ConceptD 9, I’m not sure they tried to make it small. This beast of a computer sports a 17.3-inch display that, like the D 5 and D 7, is Ultra HD and Pantone validated. It also boasts a DeltaE of 0.7. 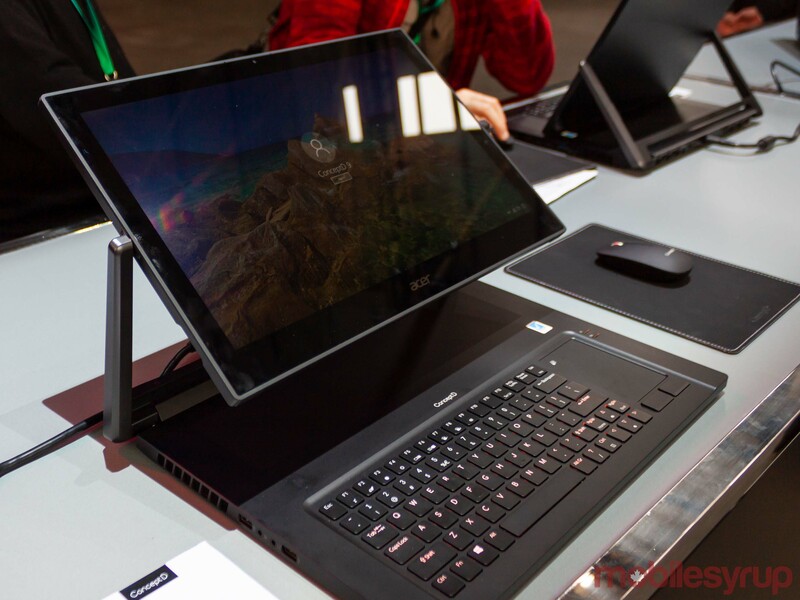 However, what really sets this display apart from the other is what Acer calls the Ezel Aero hinge. The laptop opens like a regular clamshell, but the screen can rotate as well. This allows users to manipulate the display for the perfect angles when drawing, and even lay it flat almost like a tablet. Additionally, Acer included a Wacom EMR stylus that magnetically attaches to the D 9. The style boasts 4,096 levels of pressure sensitivity for accurate control. Powering all this is a 9th Gen Intel Core i9 and full Nvidia GeForce RTX 2080 graphics, not the Max-Q style. Plus, you’ll get 32GB of RAM and two 512GB SSDs. To round out the ConceptD line, Acer also announced its ConceptD 500 and 900 series desktops. Both boasted an immense amount of power, but beyond being standard desktops, there isn’t much to say about them. The D 500 does sport a beautiful design, with a wood top panel and the thoughtful inclusion of a wireless charging pad for your phone. The company also unveiled two 3840 x 2160 4K monitors in 32-inch and 27-inch sizes. Along with the new launches, Acer gave me availability information for North America, as well as pricing in USD. A spokesperson told me Canadian pricing would be available closer to the Canadian release. 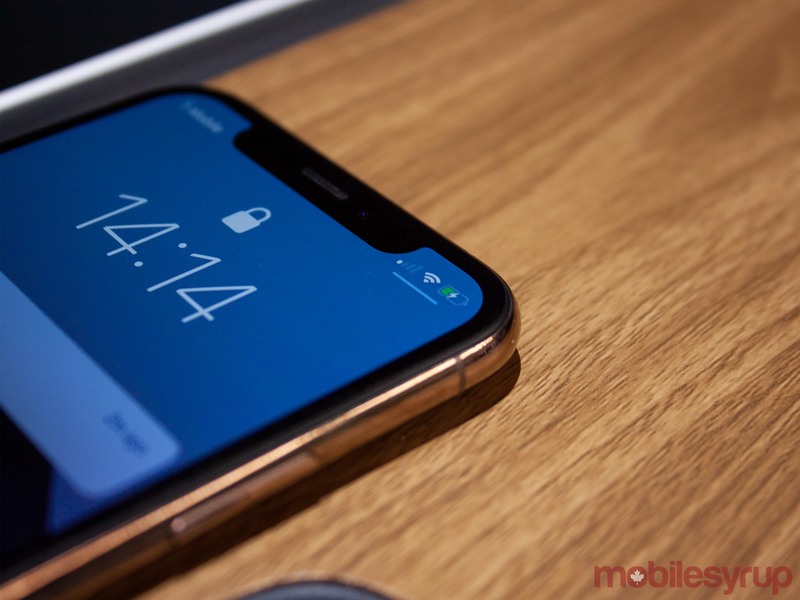 The ConceptD 5 and D 7 will be available in North America starting in April for $1,699 and $2,299 USD respectively (approximately $2,273 and $3,076 CAD). 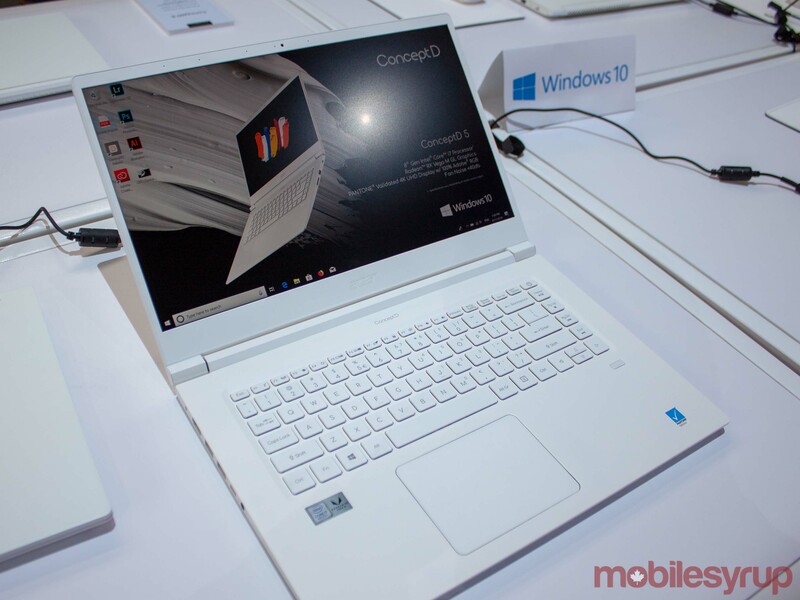 However, the ConceptD 9 won’t be available until June and will retail for $4,999 USD (about $6,689 CAD). Finally, the ConceptD 500 and 900 will be available in June and May respectively, starting at $1,699 and $19,999 USD (roughly $2,273 and $26,759 CAD).